Collecting Children's Books is hosting a blog tour for a new book today. Written by Michael Hemphill and Sam Riddleburger, STONEWALL HINKLEMAN AND THE BATTLE OF BULL RUN was recently published by Dial Books for Young Readers. Considering the subject matter of STONEWALL HINKLEMAN, I thought it might also be interesting to make a quick literary tour of other Civil War battlegrounds in children's fiction. A CHILDREN'S BOOK ENTHUSIAST. She loooves everything! AN ELDERLY WOMAN. A night-school junkie, she's currently taking an evening course in children's literature (or, as she likes to call it, "kiddy-lit." It sounds so hep!) The course description said that graduates of the class will learn enough to "possibly join the lucrative fields of professional storytelling, writing novels for young people, or maybe even editing children's books from the comfort of your own home." AN ELDERLY MAN. The elderly woman's husband, he's basically along for the ride. And the free lunches that are included in the cost of the bus tour. A BOY WITH A BACKPACK. 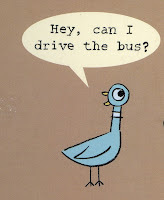 Oh yeah, we need someone to drive the bus. I think I'd better drive this bus. All aboard? Seatbelts buckled? Okay, first stop Vicksburg! TOUR GUIDE: One of the most consistent writers of historical fiction these days is Ann Rinaldi. CHILDREN'S BOOK ENTHUSIAST: Oh, I just looove her! 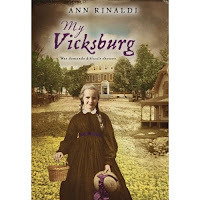 TOUR GUIDE: In Ms. Rinaldi's brand-new book, MY VICKSBURG, a young Mississippi girl and her family hide in a cave for several weeks while the Union Army attacks their town. Another interesting book about this battle is THE VICKSBURG VETERAN by F.N. Monjo (1971.) Told in the first-person voice of Fred, Ulysses S. Grant's twelve-year-old son, the story is written in a spare, poetic style that predates the current trend of novels-in-verse. ELDERLY WOMAN (confidently; she's been taking notes in class): Those verse books are very hot right now. ELDERLY MAN: If you're hot, roll down the window. BOY WITH A BACKPACK (pulling out book): What about this one? TOUR GUIDE: Oh, that's right: THE TAMARACK TREE by Patricia Clapp (1986.) This story of an English immigrant who gets trapped between the two sides of the Civil War is one of those popular books that still somehow went out of print. Patricia Clapp didn't write many books during her career, but all of them remain well-remembered and loved by a lot of readers. BOY WITH A BACKPACK: And another one. TOUR GUIDE: Rosemary Wells is an author-illustrator best known for her picture books. CHILDREN’S BOOK ENTHUSIAST: Oh, I just looove her. In front of us a soldier is crumpled in a heap, his legs draped over a log. His arms are raised about his head, stiff as iron pokers. "Look at the breast of that man's tunic now. Look, look!" Tennessee holds my hand in his and points. A little teaspoon of light, green as a cat's eye, winks out from the soldier's breast. It pops from between two buttons and holds still three inches over the top of him. Whatever it might be, it's as slight as a baby's sigh. "What is that?" I pull back from it. "Look careful now!" urges my friend, and takes my elbow as if I'm bound to faint. For one beat of a heart, the thirty-acre cornfield is a carpet of emerald stars. No bigger than dollar pieces, they spill from the fallen men as far as a person can see. Then they bubble upward and vanish into the blackness of the sky. My Tennessee friend steers me to an uphill path and gives me his lantern. "Some people say it's swampfire," he whispers, "but it was the souls going up." ELDERLY MAN: Probably just fireflies. ELDERLY WOMAN: I wonder if they sell that book in the Antietam gift shop. TOUR GUIDE: When it comes to Chancellorsville, one book primarily comes to mind: THE RED BADGE OF COURAGE by Stephen Crane. Published in 1895, this book is so popular that it's currently available in at least thirty editions -- not to mention Kindle and Cliff Notes versions. ELDERLY WOMAN: Not that anyone should ever read the Cliff Notes instead of the novel. TOUR GUIDE: Patricia Beatty's CHARLEY SKEDADDLE (1987) is frequently taught in schools. It concerns a New York boy who joins the Union army as a drummer, but deserts after The Battle in the Wilderness. This book won the Scott O'Dell Award for Historical Fiction. CHILDREN'S BOOK ENTHUSIAST: And I just looove Scott O'Dell! TOUR GUIDE: THE JOURNAL OF RUFUS ROWE by Sid Hite (2003) concerns a runaway who records the events of the Battle of Fredericksburg in a journal. Part of the "Dear America/My Name is America" series, this slim book provides a fictionalized, but believable account of an important Virginia battle. ELDERLY WOMAN: Are we going to visit any locations from RIFLES FOR WATIE (1957)? TOUR GUIDE: Actually, RIFLES takes place mostly in the west, so I don’t think any of the main Civil War battlefields are included in that novel. ELDERLY WOMAN: That’s a shame. It’s the only Civil War book that ever won the Newbrary Award, you know. I learned that in my ‘kidlit’ class. TOUR GUIDE: Although not technically part of this "battlefield tour," I think we should mention a few books that describe the awful conditions in Civil War camps and prisons. In one of his best books, Richard Peck paints a horrific portrait of life in an outdoor military hospital in THE RIVER BETWEEN US (2003.) And RED CAP by G. Clifton Wisler (1991) concerns a drummer boy sent to Andersonville Prison. CHILDREN'S BOOK ENTHUSIAST: A lot of these books are about drummer boys. TOUR GUIDE: Since these are children's books, authors often use drummers as protagonists so the story can focus on a young character. BOY WITH A BACKPACK: Don't forget PINK AND SAY by Patricia Polacco (1994.) The narrator ends up in the Andersonville Prison in this one too. ELDERLY MAN: Does anyone mind if I open the window back here? ELDERLY WOMAN: I told you not to order that chili at the Andersonville Cafeteria. TOUR GUIDE: The protagonist of Gary Paulsen's A SOLDIER'S HEART (1998) participates in many Civil War battles, but the story reaches its climax at Gettysburg. A lot of readers think this is is one of Paulsen's best books. In fact, Booklist magazine selected it as their "Top of the List" title for 1998. BOY WITH A BACKPACK: -- there’s a 1924 book by Elsie Singmaster called A BOY OF GETTYSBURG. CHILDREN’S BOOK ENTHUSIAST: I’ve never heard of her...but I bet I’d just looove those books! TOUR GUIDE: Finally, we’re arriving at Bull Run. That’s also the name of a very fine novel by Paul Fleischman, which was published in 1993. BULL RUN recreates the famous battle through the voices of sixteen people who witnessed the conflict. ELDERLY WOMAN: Wouldn’t it be wonderful if we could time-travel back to the Civil War and see what it was really like? ELDERLY MAN: Who’d want to go back to Andersonville in the 1860s? Their chili today was bad enough. TOUR GUIDE: I think every time I lead one of these bus tours through the Civil War battlefields, I’m taking people back in time a little bit...helping them to see the world as it was a hundred and fifty years ago. BOY WITH A BACKPACK: And every time we read any of these Civil War novels, we’re definitely transported back in history. It’s almost as good as being there. ELDERLY WOMAN: That is just a lovely thought. (Digging in her purse.) And I am going to share it with my kidlit teacher! TOUR GUIDE: You’re going to write it down? ELDERLY WOMAN: No, I’m going to Twitter her. (Takes phone from purse.) The past is fine, but the present has some benefits as well. TOUR GUIDE: Well, that concludes our tour of Civil War sites. Please stay seated until the bus comes to a complete stop. And I’m sure our bus driver would appreciate a tip. ELDERLY MAN: I’ve got a tip for him: stay away from the chili at Andersonville. TOUR GUIDE: And if anyone wants to know more about the STONEWALL HINKLEMAN AND THE BATTLE OF BULL RUN blog tour, you can click here. And if you’d like to enter a contest to win a signed copy of the book, a T-shirt just like the one Stonewall wears on the cover of the book, plus advance copies of other Dial Book for Young Readers, send an e-mail to blogtour@stonewallhinkleman.com and put "Stonewall Contest" in the subject line. Fabulous tour! The RED MOON passage gave me chills ... will have to check that out. Thanks for turning me on to it! Great titles, don't forget Newbery winning, Rifles for Waite, and this year's The Mostly True Adventures of Homer P. Figg. At least I'm pretty sure the bus would hit Gettysburg, but I think Waite mostly took place in what became Oaklahoma, I'm not sure what those battlefilds would be, but there was plenty of Mayhem. I second the motion for The Mostly True Adventures of Homer P. Figg, although my favorite civil war children's book from recent years is Mary E. Lyons' and Muriel Branch's Dear Ellen Bee: A Civil War Scrapbook of Two Union Spies. It's a fictional account of the two real life women -- a wealthy Southern lady and her freed slave -- who ended up working together as spies for the Union Army. The book's format is unusual; like a scrapbook, it includes newspaper clippings, recipes, photographs, etc. Magnificent, lively read. My wife and I enjoyed it over the weekend. I think the book captures the spirit of adventure that still waits within a fifth or sixth grader! Great post! I would have liked a mention of "Across Five Aprils" by Irene Hunt, but found a few titles that I hadn't heard of and promptly ordered. Great post and my daughter is love to read like this book and traveling books information is traffic. Pleasantly, the posting is truly the contemporary area of interest for this registry related issue. I harmonize along with your conclusions and can eagerly sit up for your incoming updates. Simply say gives thanks is not going to sufficient, in your lucidity in your posting. I’ll instantly grab your rss feed to keep abreast of all updates.